SYRACUSE (Newhouse Sports Media Center) — Dabo Swinney and the third ranked Clemson Tigers head to Raleigh, North Carolina, to prepare for their Thursday night matchup with N.C. State. Coach Swinney stressed the necessity of establishing the run game early, especially with the Tigers second-leading receiver, Charone Peake, sidelined with a torn ACL. Junior wide out Adam Humphries will move into Peake’s position across from star receiver Sammy Watkins. N.C. State Coach Dave Doeren has never coached a Thursday night game at Carter-Finley Stadium, but looks for the home crowd to help the team seize the opportunity. Both the Tigers and the Wolfpack are undefeated at 2-0. Neither team has played on the road yet this season, nor has either faced an ACC opponent. The contest starts at 7:30 PM and will be nationally televised on ESPN. Saturday night pits two more undefeated teams against each other as Bethune-Cookman travels to Doak Campbell Stadium to meet Florida State. The Wildcats of Bethune-Cookman stand atop the MEAC with a 3-0 record, coming off a 34-13 road win over Florida International. The Seminoles are ranked eighth in this week’s national poll and will be heavily favored at home. One of the biggest stories for FSU is the emergence of freshman kicker Roberto Aguayo, who is a perfect 17 for 17 on extra points and field goals through two games but has yet to be tested from long distance. Coach Jimbo Fisher expressed the utmost confidence in Aguayo. Kickoff is set for 6 PM Saturday night. The 3-0 Maryland Terrapins will host Big 12 rival West Virginia on Saturday afternoon. Terrapin Head Coach Randy Edsall emphasized the leadership of linebacker Yannick Cudjoe-Virgil, especially in the locker room and off the field. Cudjoe-Virgil is a transfer from Seton Hill University, giving away his scholarship to walk on at Maryland. The game will be televised on ESPNU Saturday at 3:30 PM. Coming off of a 54-0 blowout victory over Wagner at the Carrier Dome, Syracuse prepares to host the Green Wave of Tulane this Saturday. This game marks the first career start for sophomore quarterback Terrel Hunt for the Orange . Coach Scott Shafer made the decision to award Hunt the starting job over Oklahoma transfer Drew Allen after he threw for 265 yards and three touchdowns last Saturday. Both teams enter the matchup with 1-2 records. Kickoff is set for 12:30 PM Saturday. Wake Forest takes a 1-2 record to West Point this Saturday to battle Army. After winning their home opener comfortably against Presbyterian, the Demon Deacons lost to Boston College on the road and then suffered a heartbreaking two-point home loss against Louisiana-Monroe. Head Coach Jim Grobe looks for his hard-nosed defense, ranked 28th in the nation in points allowed, to hold strong against the Black Knights offensive attack. The game will be televised on CBS Sports Network beginning at noon Saturday. Another all ACC matchup this weekend sees North Carolina coming into Bobby Dodd Stadium to take on Georgia Tech. The Yellow Jackets have been electric in their first two games this season, scoring a total of 108 points and rushing for an average of 356 yards a game. Coach Paul Johnson has implemented a variation of the shotgun that he calls the diamond formation to confuse defenses as to whether the Yellow Jackets will pass or run. The Tar Heels come into this game well rested from a bye week. Head Coach Larry Fedora says that the extra week has helped prepare his defense for the Jackets infamous option read style offense. The game will air at noon Saturday on ESPN. The final head-to-head ACC contest of week four is Pittsburgh at Duke. The Panthers take a 1-1 record into Saturday’s game, and the Blue Devils sit at 2-1. Pittsburgh’s defense is anchored by senior defensive lineman Aaron Donald, whose pass rushing abilities have been drawing frequent double-teams this season. Donald is a Pittsburgh native, and Coach Paul Chryst stressed just how key his role will be in the success of the Panther defense. On the flip side, the Blue Devils and Head Coach David Cutcliffe bring a run centered offense to the table, with four different backs getting more than ten carries through their first three games. Quarterbacks Brandon Connette and Anthony Boone have split the workload thus far. Both can hurt the opponent through the air or on the ground. The game kicks off at 12:30 PM Saturday at Wallace Wade Stadium. Frank Beamer’s Hokies host the Thundering Herd of Marshall this weekend. Both teams enter the game with 2-1 records, Virginia Tech’s only loss coming in their season opener against number one Alabama. Coach Beamer had nothing but good things to say about freshman corner Brandon Facyson, who is shining early with three interceptions in three games. The Hokie defense will be tested against the Thundering Herd offense that has put up at least 30 points in each of its first three games (12th overall in points scored). The battle is set to begin at noon Saturday on ESPNU. The 1-1 Virginia Cavaliers host in-state Big South opponent VMI in week four. UVA won a tight week one game over BYU before being routed in week two by Oregon. Coach Mike London says he wants to stretch the field out more this week and look to go vertical with the ball to give his talented receivers a chance to make a play. VMI brings a 1-2 record into Scott Stadium. Kickoff is at 3:30 PM on Saturday. Miami has jumped up to number 16 in the AP polls this week coming off a bye week after an impressive win over Florida on Sept. 7. The Hurricanes are 2-0 and a 60 point favorite over visiting Savannah State this weekend. Coach Al Golden says his boys won’t be holding anything back, taking their schedule week by week and focusing on each team. Saturday at 7:00 PM is kickoff time at Sun Life Stadium. Steve Addazio and Boston College have a bye week this week and will face ACC opponent Florida State on Saturday, Sept. 28. Both Syracuse and Virginia Tech are vying for their 700th program win this weekend. By Mason Walling – Dabo Swinney and the third ranked Clemson Tigers head to Raleigh, North Carolina, to prepare for their Thursday night matchup with N.C. State. Coach Swinney stressed the necessity of establishing the run game early, especially with the Tigers second-leading receiver, Charone Peake, sidelined with a torn ACL. Junior wide out Adam Humphries will move into Peake’s position across from star receiver Sammy Watkins. N.C. State Coach Dave Doeren has never coached a Thursday night game at Carter-Finley Stadium, but looks for the home crowd to help the team seize the opportunity. Both the Tigers and the Wolfpack are undefeated at 2-0. Neither team has played on the road yet this season, nor has either faced an ACC opponent. The contest starts at 7:30 PM and will be nationally televised on ESPN. SYRACUSE, NY — The fifth-year senior transfer or redshirt sophomore? That is the question students, faculty, fans, and the local media have been asking. After two dismal performances to start the season, senior Drew Allen found himself on the hot seat. With a touchdown to interception ration of 1:6, you can’t blame Orange Nation seeking answers. Terrel Hunt, the 20-year old from Queens, led the first team during spring drills and split time with Allen for most of training camp. He was considered the early front-runner by most accounts. Head Coach Scott Shafer revealed recently to The Daily Orange that he spoke with Hunt during summer and told him Allen would be the number one quarterback. The dilemma? Hunt would have to keep it a secret for two weeks before the season got under way versus Penn State. A classic chess match with an opposing head coach. Allen, who had a handful of schools to choose from, transferred from Oklahoma and came to Syracuse knowing he would have a legitimate shot to run the offense. So far, it had been nearly unwatchable for the Orange faithful. After SU was dismantled at the hands of #19 Northwestern, the debate heated up. Stay with the struggling Allen or bring in the young gun, Hunt? Quarterbacks coach Tim Lester told reporters earlier in the week the plan was to play both QBs versus Wagner. To start the home opener, Allen went 3 for 6, for a combined negative one-yard. After three consecutive three and outs (and a gift field goal, due to a Wagner fumble deep in its own territory) the crowd grew restless and began to boo. On the fourth offensive possession, Terrel Hunt ran on with the first unit to the delight of the crowd. He led a 68-yard drive, completing all three passes for 30 yards and a heavy dose of handoffs to running back Jerome Smith. With eight rushing attempts for 31 yards, Smith capped the drive with a 2-yard touchdown run, while the quarterback jumped in excitement and congratulated his offensive line. It appeared that the Hunt Era had officially begun. The very next drive Hunt unleashed a 42-yard bomb to Jarrod West. A quick check down pass to Prince-Tyson Gulley resulted in a 13-yard touchdown, the first of Hunt’s career at the Carrier Dome. The home crowd was lively again, while Drew Allen’s collegiate career as a starter might have come to an abrupt end. During the media session earlier this week, Hunt was asked if Coach Shafer would implement a dual quarterback system, similar to Northwestern’s offense. He continued expressing his desire to lead the team. The Orange cruised to a 37 point first half lead and never looked back, winning 54-0. Hunt was in control and looked poised under center, scrambling when necessary; making plays with his feet that his predecessor simply could not. Syracuse plays at home the next two games. First the Orange faces Tulane, then a bye week, followed by the #3 ranked Clemson Tigers, in SU’s first ACC matchup of the 2013 season. 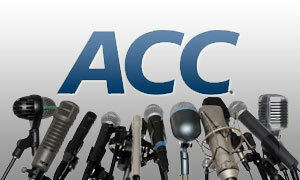 Two divisions create the newly aligned Atlantic Coast Conference. Stay tuned to Newhouse Sports Media Center for the latest collegiate action at SU. 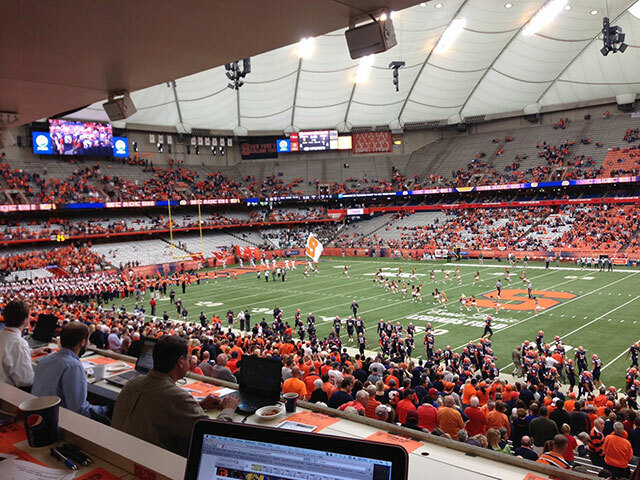 SYRACUSE (Newhouse Sports Media Center) — Coach Scott Shafer earned his first win as head coach of the Syracuse Football team in its 54-0 win over the Wagner Seahawks on Saturday afternoon. The Orange were first led on offense by quarterback Drew Allen. However, halfway through the first quarter the switch was made to sophomore quarterback Terrel Hunt. The presence of Hunt on the field ignited a spark that had been absent in the starting offensive drives. Syracuse developed a smooth offensive rhythm that led the team to its first win of the season. The sophomore quarterback had a completion percentage of .833 against the Seahawks leading the offense to score six touchdowns in the first three quarters of the game. Ryan Norton’s field goal early in the first quarter gave the Orange its first lead 3-0, after Junior Linebacker, Dyshawn Davis recovered a Wagner fumble on the 18-yard line. The Syracuse defense continued to apply pressure to the Wagner offense early in the first quarter when Jay Bromley sacked Wagner quarterback, Matt Misley, causing him to fumble the ball on the Seahawks 10-yard line that resulted in a 13-yard loss and forcing the Seahawks to punt. The energy in the dome rose as Terrel Hunt took the field as quarterback in place of Drew Allen who was 3 of 6 passing in Syracuse’s first 3 drives. In Hunt’s first drive he moved the offense 68-yards down the field where Jerome Smith rushed into the end-zone from the Wagner 2-yard line with 2:23 left in the 1st quarter, giving the Orange a 9-0 lead. Norton missed the extra point. At the start of the second quarter the atmosphere in the Carrier Dome transitioned from low-energy to electric when Hunt completed a 42-yard pass to Jarrod West that placed the Orange on the Seahawks 22-yard line. Hunt then completed a sideline pass to Prince-Tyson Gulley for a 13-yard touchdown giving Gulley his second touchdown of the season. With 9:14 left in the 2nd quarter, the offensive momentum did not wear down. Hunt using his feet to keep the play alive led the offense on a 59-yard move down the field that resulted in a nearly untouched, 8-yard rushing touchdown by Jerome Smith. The energy in the Carrier Dome exploded in the middle of the second quarter when running back, Devante McFarlane, scored from 3 yards out to bring the Orange up 30-0 against the Seahawks. The Syracuse defense meanwhile shut down the Wagner offense throughout the entire first half. For six consecutive possessions, Wagner was unable to move the ball and forced to punt each time giving the Syracuse offense more opportunities to make plays happen. Late in the first half there was a breakdown in the Seahawk coverage. Chris Clark got behind the secondary andHunt launched a deep pass to him for a 41-yard touchdown, bringing the score to 37-0. The Syracuse offense entered the locker room at the end of the first half with a total of 338 offensive yards compared the Seahawks’ 30. The Syracuse defense ended up with the ball one last time to end the first half. Wagner committed its second turnover of the game when linebacker Cameron Lynch picked off a Matt Misley pas and returned it 47 yards. Taking the field of the Carrier Dome after half time, the Orange defense returned in full force allowing the Wagner offense to gain only seven yards in its first possession of the half. The Seahawks managed to hold the Orange to a field goal after a 28-yard drive on the first possession of the second half. Ryan Norton hit from 32 yards to put Syracuse up 40-0. The Carrier Dome erupted during the offense’s next possession as Hunt sent a deep pass down the center of the field, 65-yards, to Jarrod West who carried it into the end zone, widening the Orange’s lead 47-0. The Seahawk offense continued to battle the Orange defense, but fell short when Syracuse strong safety, Durell Eskridge, intercepted a pass thrown by Misley returning the ball 11 yards to the Wagner 34-yard line. Drew Allen then returned to field to lead the Syracuse offense on another scoring drive which was capped off with a 4-yard pass to Chris Clark in the end zone. The score remained for the entirety of the fourth quarter 54-0 with neither team reaching the end zone giving the Orange its first win of the season. Syracuse will host Tulane Saturday, September 21 at 12:30.p.m and the on October 5 will face its first ACC opponent, Clemson, at home in the Carrier Dome. SYRACUSE, NY- Coach Scott Shafer earned his first win as head coach of the Syracuse Football team in its 54-0 win over the Wagner Seahawks on Saturday afternoon. SYRACUSE (Newhouse Sports Media Center) — The fifth-year senior transfer or redshirt sophomore? That is the question students, faculty, fans, and the local media have been asking. After two dismal performances to start the season, senior Drew Allen found himself on the hot seat. With a touchdown to interception ration of 1:6, you can’t blame Orange Nation seeking answers. SYRACUSE (Newhouse Sports Media Center) — Drew Allen will start this weekend in the home opener against Wagner, but Terrel Hunt will also make an early appearance in Saturday’s game, according to head coach Scott Shafer. Hunt, who had a 15-yard run to record his first career touchdown last weekend against Northwestern, will take the field early to lead the Syracuse offense. Coach Shafer thinks it’s important to get both players into the game to improve the quarterback position. In last weekend’s game against Northwestern, Shafer saw good things on the field from Allen, who had a 66-percent completion rate, but it was the number of turnovers that hurt the team’s offense. · Taking advantage of the third down by controlling the number of plays it takes to get to the first down. After a week of focusing on their target areas, Shafer said the Orange are ready to play in the Dome for the first time this season. The players are not the only ones excited to face the Seahawks, Shafer says he is also ready for Saturday’s game. (Syracuse)- Drew Allen will start this weekend in the home opener against Wagner, but Terrel Hunt will also make an early appearance in Saturday’s game, according to head coach Scott Shafer. SYRACUSE (Newhouse Sports Media Center) — Leading up to this weekend’s football home opener, the ACC held its weekly teleconference with each head coach. The Syracuse Orange (0-2) take on the Wagner Seahawks (1-1) in a interstate matchup. The hot topic this week surrounds the quarterback position. Drew Allen, the fifth-year transfer from Oklahoma, has started both games with inconsistent play. Sophomore Terrel Hunt, who was thought to be the front-runner during training camp, is expected to play more significant time on Saturday. 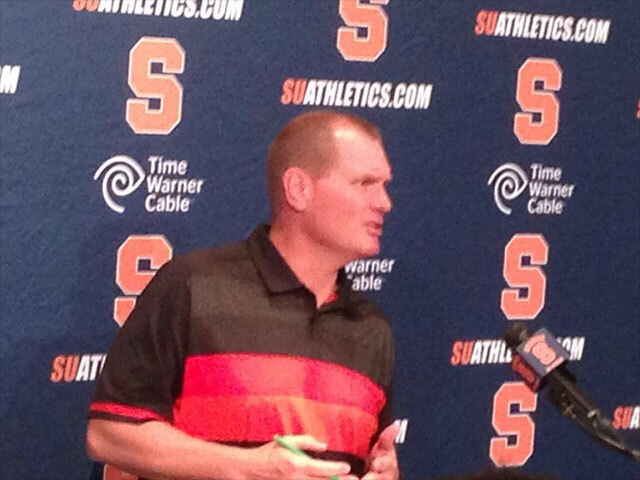 Below are press highlights from Syracuse coach, Scott Shafer. Q. I know you’ve been asked a lot about your quarterbacks. With Drew, the way he played in the first two games, have you been able to pinpoint in watching the tape why he’s had some of the struggles he’s had? SHAFER: With Drew, first thing is, we had two good opponents in Penn State and Northwestern. He got thrown to the wolves early, which is in the long run is going to be a good thing. I was pleased with his increased completion rate. I think he was 66% in the Northwestern game. Biggest thing with Drew, he’s got to eliminate the turnovers. Sometimes he’ll get locked in on a target. He’s just got to do a better job checking down. When things are muddy, he has to go down to the check-down, get the ball out of the backfield, not try to force things. Q. I’m wondering if going into this week there’s anything you say to Drew so he doesn’t play with any sort of feeling pressure? SHAFER: I think more than anything, it’s just getting into the flow of the game, trust his eyes, go play, have fun, enjoy the process. I think any time you have a player at any position that is trying hard to continue to improve in his game, you want to make sure that his focus isn’t so tight and narrow that he’s not playing with the flow of the game. Q. Obviously you’re off to a tough start. Given the opponents you played, people wouldn’t expect you to be off to a much better start. Are you where you thought you would be at this point in the season? SHAFER: I have to look at all the different pieces and parts that make up the formula. We played poorly, especially coming out of the first half against Northwestern. Some of the things we need to continue to focus on is, first and foremost, the turnover ratio. We’re sitting at minus three. You can’t win a lot of games when you’re at minus three. We need to get in the plus category. That’s been a focus last week as well as this week. Q. The thought process after the Northwestern game, how seriously did you consider starting Terrel and how did you get to the ultimate decision where you wanted to give Drew another shot to start against Wagner? SHAFER: We went through it. For me it was, Let’s take a look at who we have playing, what areas we have to improve on. Are they areas we feel any player could improve upon? In his situation, I felt strongly that he could definitely do that. But I also feel good about the fact that Terrel went in and did a good job, played well. I liked his approach and attitude. Both guys will be ready to play this weekend. Q. Considering Wagner is an FCS team, does that factor into the decision at all? SHAFER: No. We have a team coming off a championship season and broke records. Regardless of where they’re at, a championship team is a championship team. We need to approach it the same way we would any solid football team we’re going against. Q. Recap the last two games. What do you need to work on this Saturday against Wagner? SHAFER: We have to look at turnover ratio, both offense and defense, and strive towards trying to get on the plus side. We’re at minus three. I’d love to come out of the Wagner game and be at plus one or better and feel good about that offensively. Then defensively eliminating the big play. That’s been our focus this week on both sides of the ball, and we’re looking forward to reaching our objective against Wagner. Q. What do you see in Wagner in the video? What type of team are they on the field? SHAFER: They’re a team that plays extremely hard on both sides of the ball. They’re a team that has some returning veterans that were part of a storied season, winning their conference championship in 2012. They put up 35 points a game on offense right now. They have a running back that’s averaging over 200 yards a game in Dominique Williams. They have a quarterback that is mobile, can both throw and run, and can create plays to be extended with his feet. 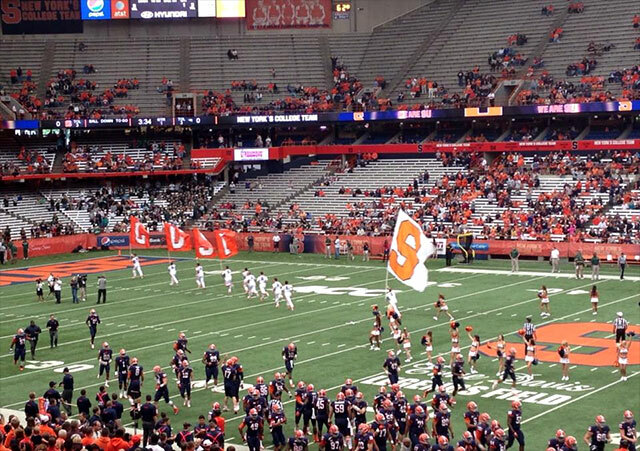 Catch the action Saturday, when the Syracuse Orange face the Wagner Seahawks. The game will air live on ESPN3, from the Carrier Dome, at 4 PM EST. SYRACUSE, NY — Leading up to this weekend’s football home opener, the ACC held its weekly teleconference with each head coach. The Syracuse Orange (0-2) take on the Wagner Seahawks (1-1) in a interstate matchup. The hot topic this week surrounds the quarterback position. Drew Allen, the fifth-year transfer from Oklahoma, has started both games with inconsistent play. Sophomore Terrel Hunt, who was thought to be the front-runner during training camp, is expected to play more significant time on Saturday. SYRACUSE (Newhouse Sports Media Center) — He had one of the best seats in NBT Bank Stadium right behind home plate. At first glance you might suspect him to be just an overly enthusiastic fan, notebook in hand, jotting down every play and statistic. 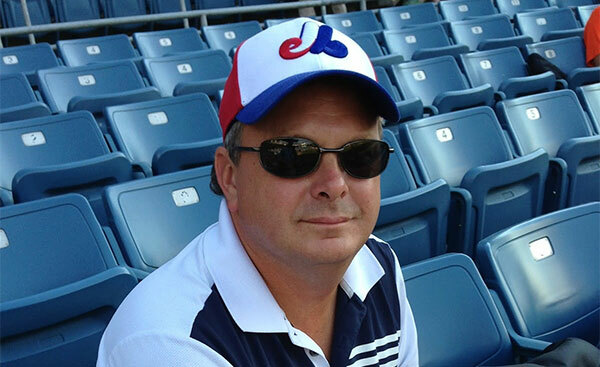 Dan Bondgren is not just a fan of baseball; he is also an employee of Baseball Info Solutions—a company that specializes in collecting, interpreting, and disseminating baseball statistics. Baseball Info Solutions assigns a group of employees to cover Double-A or Triple-A teams. 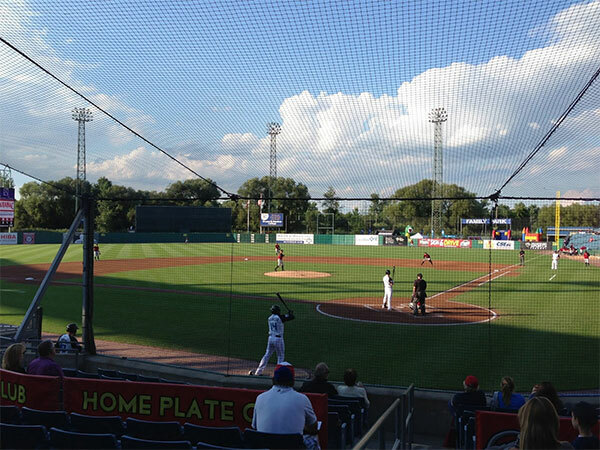 Dan’s assignment is to attend the Syracuse Chiefs game. For Bondgren this is just a part time job, he says he has another job that isn’t related to baseball. Bondgren found the job listed on Craiglist three years ago. Getting paid to watch baseball games as a part-time job is pretty nice, Bondgren said. He wouldn’t reveal how much the company pays him to attend each game though. During Chiefs games he rarely has time to put his clipboard down because of all the data he is collecting on the game, Bondgren said. “We keep stats for minor league games that get uploaded into a computer so that if scouts or major league teams want to know the ins and outs of a player, and what they can do in certain situations they pretty much have it at their disposal,” Bondgren said. After each game, he goes home and enters the information into a computer application that the company sets up. Bondgren says, after he puts the information in, he is still amazed with how it is compiled. The information they gather is not open to the public, Bondgren said. While he gets paid to attend almost every single game, he also knows a lot about the Chiefs as well, Bondgren said. Before he worked with Baseball Info Solutions, Bondgren says he was always a huge fan of the Syracuse Chiefs. He even managed to cheer for the Chiefs whenever he had the chance. Even though the team is in last place, Bondgren says he is grateful for the job and will continue to work for Baseball Info Solutions as long as he can. He had one of the best seats in NBT Bank stadium right behind home plate.